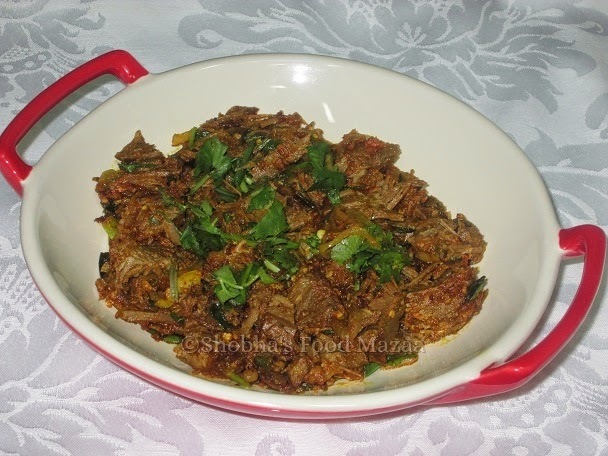 Dry and spicy stir fried boneless mutton recipe for all the meat lovers. You can serve it as a snack or a side dish with naans / rotis / phulkas. I am sure you will love this preparation. I have pressure cooked the mutton first and then sauteed with onion and spices as the meat here doesn't cook so easily. In India you get tender meat and you can make this directly on a slow fire sprinkling a little water in between the sauteeing. You may also use meat with bones if you like. Onion .................. 1 medium sized chopped finely. Ginger ........... 1 inch piece grated. Green chillies ... 1-2 slit or chopped finely. * Whole spices like cinnamon stick, bay leaves and cardamoms ... add in the pressure cooker while boiling the meat. 1. In a pressure cooker take 2-3 cups water and tip in the whole spices*. Add the cleaned meat pieces, a little salt and turmeric. Boil the meat until 3/4 ths done. Remove the pieces and store the stock for future use. You can even freeze it after cooling. 2. In a pan or a wok add oil or desi ghee and fry the onion until light pink. 3 .Add the slit green chillies, ginger and garlic. saute for half a minute. 4. Put the mutton pieces and one fry again for a minute. Add the tomato puree and slit green chillies. 5. One by one add all the spices except garam masala which we shall add towards the end. 6. You may sprinkle a little water while sauteeing if the meat is not cooked. 7. Whisk the yogurt and add it to the meat stirring immediately to blend into the masalas. 8. Tear the mint leaves with fingers and add it. Simmer it until done. I am a vegetarian but I am sure meat lovers would love this recipe.